Elk Bugles: Happy Birthday, Colorado! History lesson: On August 1, 1876, U.S. President Ulysses S. Grant signed a proclamation admitting Colorado as the 38th state. Colorado is nicknamed the "Centennial State" because it was admitted to the Union in 1876, the centennial year of the United States Declaration of Independence. In 1976, to celebrate the state's 100 birthday, Colorado lawmakers were looking for a theme song to mark the occasion. Ernie Kemm (who I write about in this 2010 post) penned a song, and entered the statewide contest to find the best tune - and won. So Kemm, with help from Gunnison's Western State College singers, recorded "Here's to Colorado" (Dr. Lee Keilson, director and Perry Arnett, arranger). Listen to "Here's to Colorado." 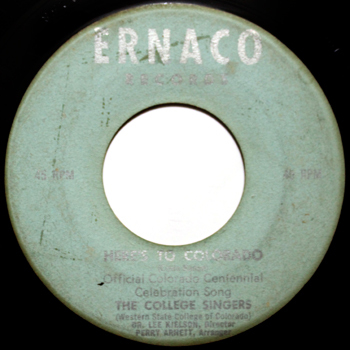 The song was released on Ernie's own Ernaco label (no label number). You'd think there would be a second Colorado celebratory song on the flip, but the b-side is the jazzy "We Met in Paris" (lead vocals by Kemm).